Nakia (Lupita Nyong&apos;o), T&apos;Challa/Black Panther (Chadwick Boseman) and Okoye (Danai Gurira) in the film "Black Panther," directed by Ryan Coogler. Students from around Boston will be treated to a free showing of an action-packed superhero flick during school vacation week thanks to a viral social media movement. 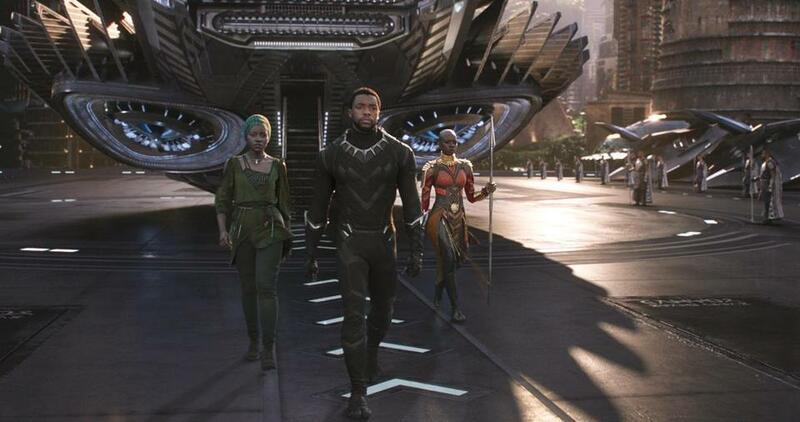 Liz Miranda, executive director of the Hawthorne Youth and Community Center in Roxbury, has raised nearly $10,000 through an online crowdfunding campaign to buy hundreds of tickets for students to see “Black Panther,” the latest Marvel film set to hit screens Friday, which features a predominantly black cast. As of Monday morning, Miranda’s GoFundMe.com page had collected more than $9,000 from 253 donors. She hopes to raise even more money before this weekend’s movie debut — a goal that seems more than likely as donations continue to flow in by the hour. Miranda’s fund-raiser was inspired by a national movement online that was started by New York City philanthropist Frederick Joseph last month. Joseph crowdfunded money for young kids in Harlem to go see the movie when it comes out. As his idea went viral —it eventually landed him on The Ellen DeGeneres Show— he started the hashtag #BlackPantherChallenge, and encouraged community organizers across the country to launch similar fundraisers in their respective neighborhoods. There are now over 400 campaigns that have raised over $400,000 combined, according to GoFundMe’s website, including in Boston. Meanwhile, Miranda said her plan, so far, is to get roughly 500 kids — and some elderly residents — from all over Boston into movie theaters this weekend and next week. The goal is to cover the cost of both the movie tickets and food for students and chaperones who attend. Students from TechBoston Academy were some of the first to learn that they would be seeing the film for free, alongside their classmates. Lianne Hughes, a history teacher at the school, will be taking 34 students from her honors class to see “Black Panther” on Friday morning. Fifteen-year-old Candace Ells, one of Hughes’ tenth-grade students, said the class was “ecstatic” when they found out they were going to see the movie. She said films often depict African-Americans as slaves, or criminals, and to have a movie like “Black Panther,” which portrays people of color in a positive light, will make the experience that much more special. Miranda is working with city groups and schools to dole out additional tickets and arrange for movie viewings next week. She is also continuing her fund-raising efforts in hopes of reaching a total goal of $25,000, so even more children can see the film.